3 How can I add my data / my streets / my tracks to the VeloMap? 4 I have a Velomap Premium Membership – can I also download OpenMTBMap Premium Maps? 5 When will (my) edits show up in the VeloMap? 6 Can you offer combined maps, e.g. Italy/Switzerland/Austria/Germany ? 7 Country / Area X is not yet offered. 9 How should I update my Maps? 12 Mapsource doesn't start and complains that no maps are installed. 13 Mapsource doesn't start and complains it has to be reinstalled. 14 Is there a possibility to send maps faster than with Mapsource? 17 Can you help me with Mapsource, mkgmap, …. 20 I don't like the colors, design, streets are too fat, not well visible on my GPS, etc…. How can I add my data / my streets / my tracks to the VeloMap? I have a Velomap Premium Membership – can I also download OpenMTBMap Premium Maps? Mac OSx – just scroll down on the Mac OSx download page. When will (my) edits show up in the VeloMap? Usually at the latest 8 days after you commit them. VeloMaps get updated once weekly. Can you offer combined maps, e.g. Italy/Switzerland/Austria/Germany ? Yes if you donate there is a full map of Europe for download. You could also download the Alps map. Country / Area X is not yet offered. By now I have worldwide maps. Some maps are for people who donate only (North America & full map of Europe). In Principal – if it is offered by geofabrik ( http://download.geofabrik.de/ ) as extract, I will have a map for it. If not yet – please drop me a comment. If Norton Antivirus is installed on your computer, you may get a warning that the "WS.Reputation.1" threat is found after downloading most maps. Unfortunately, the unsuspecting user has been put on the wrong track: WS.Reputation.1 isn't a virus at all! Symantec (the creator of Norton) uses the following rule: popular programs that are downloaded often are probably safe. Programs where this doesn't apply (and that Symantec doesn't know of) are labeled unsafe automatically; even when it isn't harmful at all. As ist performs many lowlevel operations on the .img mapfiles, many antivirus will consider it a thread. If you are still unsure, please simply unpack any .exe you downloaded from here. All windows installers are nothing more than archived map files, plus the installer which adds some entries to the registry so that Garmin programs find the maps. How should I update my Maps? a) Just run a new installer ….. or …. b) first click on uninstall.bat or uninstall.exe, then delete all files from the folder, then put in the new files, and then reinstall. Comments about this will be deleted from now on whithout mercy, WTF – do you think I write the tutorials so you come ask questions before reading the solutions? Mapsource doesn't start and complains that no maps are installed. Mapsource doesn't start and complains it has to be reinstalled. Usually this should not happen. There are several ways to solve this. 1. click on uninstall.exe or uninstall*.bat ("run as administrator" or it won't work). If it has been the map you just installed and it still not works then another map is responsible but not one you downloaded from velomap.org. To solve it see 2. 2. Install Mapsettoolkit cypherman1.googlepages.com/home and delete any map you suspect maybe breaking Mapsource. To help you finding maps installed incorrectly click on "Check Registry". You can use mapsettolkit to reintall any map that didn't break Mapsource via the "Install" button to the right of "Check Registry". ONLY CONTACT ME PERSONALLY BY EMAIL IF: you have checked and found out that it was one of my maps breaking Mapsource. In that case I will need your OS, Mapsource Version, and which map it has been including the date of download. If you didn't read through here and tried mapsettoolkit I will not respond to your mail. .
3. Install Mapsource 6.16.3 – it does not crash as easily as old version and is much more tolerant for faulty maps. it is more complex than Mapset Toolkit though – but also more modern and actually finds more errors without showing unimportant ones. Is there a possibility to send maps faster than with Mapsource? Well did you read through the tutorial? You can send maps directly to an external card reader, then it will be much faster than to your GPS connected via USB. Once exportet as gmapsupp.img, you can combine several gmapsupp.img with gmaptool. Read gmaptool documentation on how to do that. It's not trivial for beginners…. Have you read through About–> Autorouting? Try setting the same settings (start with Car/Motorcycle and enable/disable "avoid toll roads", and use "faster route"). The main difference is that Mapsource can calculate longer routes without inbetween points and calculates faster. The only unit currently having more or less it's own mind is the Garmin Edge series, which also has no "avoid toll roads" option to set to deactivate routing over non "trekking bike suitable" ways. Autorouting is very complex. This is a well known problem for which there is no solution (yet). Both Mapsource and the GPS units are quite limited in calculation power. Try to route over shorter distances. The better the OSM Coverage is in your area, the more likely a long route will be calculated. The bicycle mode further makes route calculation over longer distances even worse as it excludes many roads from routing. Commercial Maps like City Navigator or OSM maps made for caruse work better because they use highway=motorway and highway=trunk for long distances and thereby reduce the number of times you have to turn. There is a maximum limit of 100 turns to reach your destination without putting inbetween nodes – but likely with velomap the limit is more 10-40 turns depending on how well the area is mapped. Note that the GPS may well need 1-2 minutes for longer calculations (and don't trust the progress bar, it's broken on many units, so just because it arrived on the end does not mean that the route cannot be calculated). The velomap is not intended to autoroute you from city to city but autoroute you over nice trails on rather short distances. My goal is that routing works in well mapped areas on air distance of around 40-50km without breaking down. I will try to further optimize to reach this. Currently if an area is well mapped it is rather 10-30km. If a road is not connected the GPS will not route you along. Please correct any unconnected streets you notice. (also connect gondolas or cablecars to streets so they can be used too for routing). .
Can you help me with Mapsource, mkgmap, …. Sorry, that's private now. I had too much bad experience, and few actual use and improvements. a) Sea is rendered incorrectly – this is currently very difficult to achieve with mkgmap. I am sure this will change sometimes. Also very often people crash the coastline in OSM data, or the extract by geofabrik crashes the coastline. b) Instead of an area there is another area rendered. Please use Multipolygons to solve this. There is no way mkgmap can know what is above or below. c) Some area (mostly water of forest) is not rendered at all in some places. Is the area a Multipolygon Relation? Sorry currently not supported by mkgmap. This case is very rare (one expample is the Wienerwald missing). Mapnik and Osmarender have better implementation of Multipolygons and also support unofficial tags like layer=value. There is however no possibility to implement something like layer for Garmin maps. If several Polygons overlap, the definitions in the .TYP-file determine which is shown on top of each other. This has to be done for the whole map. I.e. it is hit and miss whether to show water over forest, or forest over water. So depending on the TYP-File some maps for Garmin will show areas in some places and drop others, and the other way around. BTW also maps sold by Garmin heavily (even much worse) suffer from this problem. I don't like the colors, design, streets are too fat, not well visible on my GPS, etc…. You can change your Typfile using maptk . You can basically change the layout as you like, or also make certain roads/objects invisible. This is rather advanced, note that I will not help you on that, but the GPS Forums are full of advice on this. Put a comment below. If I feel it's important I will write a new topic or add it to the FAQ. Die Karten (VeloMap und OpenMTBMap) sind top, benutze sie für jegliche Sportarten. Da ich viel mit den Tourenski unterwegs bin, wäre es super wenn es zusätzlich zu den Höhenlinien die Möglichkeit gäbe Hänge mit einer Neigung über >30° anzuzeigen. Wäre dies anhand von den Daten im Openstreetmap überhaupt machbar? Das wird nicht gehen – da Garmin das integrieren müsste. Es wäre prinzipiell möglich – da die Karten ja ein DEM enthalten, aber Garmin wird das kaum umsetzen. Guten Tag, auf mein Garmin 64st möchte ich gerne Karten laden. Im neuen MapInstall kommt während der Installation eine Fehlermeldung für die Asien-Gesamtkarte. Andere Karten kann ich installieren. Wie du hier beschrieben hast, habe ich dann den MapManager, -Install und Basecamp downgegraded. Im MapInstall zeigt es mir, auch wenn ich nur die Speicherkarte im Computer einsetze an, dass ich nur 4 GB (wie der Gerätespeicher) zur Verfügung habe. Auch das Formatieren der 32-GB-SD hat nichts gebracht. Wie kriege ich trotzdem die Asien-Gesamtkarte drauf? Fehlermeldung in wie fern? Mehr als 4GB auf einmal senden geht nur wenn du direkt an die Sd Karte im Gerät selber sendest – nicht wenn die SD Karte in einem Speicherkartenlesegerät ist – ich würde trotzdem empfehlen nur den benötigten Bereich großzügig zu senden – und nicht alles – ab einer gewissen Kartenmenge bremst du dein Garmin sonst aus. Diese Fehlermeldung kommt jedes Mal, wenn ich Teile der Asien-Gesamtkarte installieren möchte. Die einzelnen Länder kann ich installieren. Da es aber für Laos keine Einzeldatei gibt, muss ich dieses Land von der Gesamtkarte nehmen. Kann es mir irgendwie nicht ganz erklären, da ich die Karte nun schon mehrfach deinstalliert habe und sie nach deinem Tutorial installiert habe. Vielen Dank übrigens für deinen Service und deine schnellen Antworten! Die Installation hat nun geklappt. Es ist keine Fehlermeldung gekommen. Wenn ich allerdings mein Garmin starte kommt die Meldung: “Can’t Authenticate Maps. Contact content seller for help.” Sorry für die Umstände, aber komme echt nicht weiter..
du darfst nicht die Unicode Karten auf deinem Garmin verwenden – nimm die Non Unicode (also Kartendaten UND Installer neu herunterladen). meine ersten Gehversuche zum installieren auf mein Garmin Dakota 20 sind leider nicht erfolgreich. World Base Karte angezeigt. Jeder Versuch meine Kachelauswahl im Scale zu vergrößern bringt überhaupt nichts. Eine Topographische Darstellung mit all den Beschreibungen funktioniert einfach nicht. Vielleicht hast Du einen Tip oder Ratschlag. Ich benutze seit Jahren die Velomap zum Routen meiner Radtouren. Bereits vor längerer Zeit habe ich auf ein Problem mit dem Garmin Montana hingewiesen: Das Gerät schaltet sich selbsttätig aus, wenn bestimmte Straßenkreuzungen Teil des Routings sind. Das war zu der Zeit eine nervige Angelegenheit, trat aber glücklicherweise nur selten auf (ca. zwei mal pro 1000 km). In diesem Jahr habe ich die Velomap aus dem März 2017 benutzt, um eine Tour durch den Osten zu fahren. Hier kam dieses Ausschalten des Garmin quasi an jedem Kreisverkehr. Wenn das Gerät ausschaltete, wusste ich ohne Karte, dass ein Kreisel kommt. Ich schalte hinter dem Kreisel wieder ein, aber es fehlen regelmäßig die Routing-Hinweise für die zu nehmende Ausfahrt. Was ist hier falsch? Hmm – sehr komisch. Du bist aber nicht der erste der bei Kreisverkehren Probleme mit ausschalten hat – aber bei jedem hab ich noch nie gehört. Ich werde das im morgigen Update daher jetzt einfach mal so machen – dass Kreisverkehre in der Karte wie normale Straßen gehandhabt werden – gibts halt keinen Hinweis bei Ausfahrt X rausfahren – sondern nur noch rechts abbiegen. Du kannst ja am Montag die neue Karte dann mal runterladen – und bitte berichten ob sich das Problem damit löst (Achtung die Europakarte von heute/gestern ist noch ganz normal mit Standard Kreisverkehren). Leider bin ich erst jetzt zum Testen gekommen, da meine Tour noch nicht beendet war. Ich konnte also nur die Germany-Karten vom 22.09. laden und ausprobieren. Ich habe zusätzlich auch das Montana-Update 7.30, das eigentlich solche “Shutdowns” vermeiden sollte neu installiert. Der Fehler besteht weiterhin, mit der Änderung, dass jetzt kein “Shutdown” mehr kommt, sondern das Routing bleibt einfach auf der Position stehen. Nachtrag zu meiner Frage: Auffällig war, dass diese “Shutdowns” nur bei neuen Kreiseln (jünger als zehn Jahre) kamen. Ältere Kreisel machten keine Probleme. Deswegen auch die Häufung im Osten, dort sind viele neue Kreisel entstanden. Hmm – wann der Kreisel gebaut wurde sollte komplett egal sein. Kannst du mal zwei Kreisel verlinken mit Absturz, und zwei Ohne? (also OSM Link). Im Prinzip sind die jetzt ja nicht mal mehr als Kreisel in der Karte – sondern nur noch als Straßen die eine Runde machen. Ich habe jetzt nach meiner Tour das Problem noch einmal systematisch angepackt. 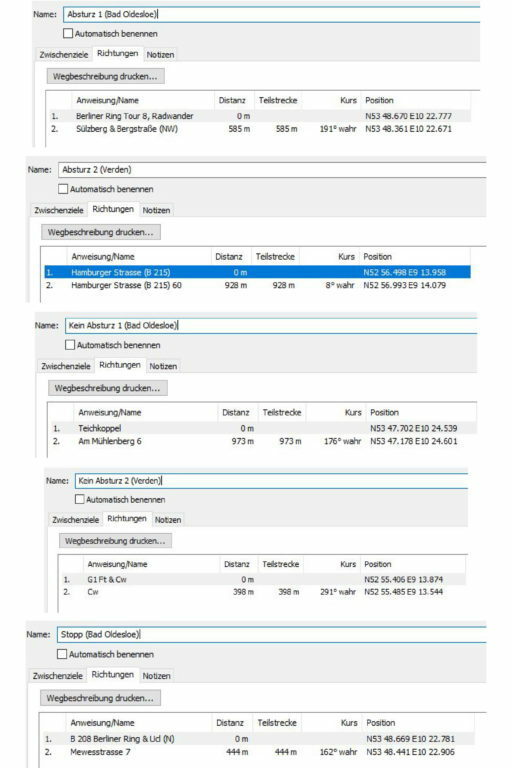 Deshalb muss ich mein Hinweis vom 24.09. relativieren: Das Routing läuft jetzt bei der Version vom 22.09. über die Kreisel hinweg, aber bei meinem “Test-Kreisel” stoppt das Routing an einer Kreuzung vor dem Kreisel. Beim Start hinter der Kreuzung gibt es keine Probleme. Leider ein dummer Zufall, der mich verwirrt hat. Leider kann ich nicht mit einem OSM-Link dienen, aber vielleicht reicht ja auch die anliegende Auflistung der Routen, die ich auf meinem Montana 600 als Test-Routen benutze (GPS ausschalten -> Standort kurz vor Routenstart setzen -> Route simulieren). Wenn Du mir eine Mail-Adresse schickst, kann ich Dir die Routen auch als GPX-Dateien schicken. Die Abstürze der Versionen Europe 02.03.2017 und Germany 18.08.2017 sind reproduzierbar. Bei der Version Germany 22.09.2017 keine Abstürze mehr, allerdings auf der Teilstrecke “Stopp” ein Anhalten des Routings. Dieselben Routen mit der Freizeitkarte Deutschland+ Version 18.09.2016 laufen durch. du kannst einfach auf die Benachrichtigungs Mail der Antwort antworten – schick mir bitte einfach mal die Routen als GPX oder GDB zu. Ich würde gerne meine Mitgliedschaft kündigen, da ich die Karten nicht mehr nutzen kann. Was muss ich tun? “can t Authenticate Maps. Contact content seller for help. Steht doch groß oben drüber – beim MOntana 610 kannst du keine Unicode Karten verwenden (wenn also bei der Karte (Unicode) dabeisteht – musst du auf die Non Unicode Version ausweichen). Das TYP file wird von Basecamp neu geladen, wenn man in den Einstellungen -> Anzeige -> Bezeichnungen die Detailstufe verändert. Leider sehe ich in Basecamp (macOS) keine Änderung. Liegt am Cache. Bin mir grad nicht sicher wie du unter OSx den Cache löschst – probier mal wo reinzuzoomen wo du noch nie nah reingzoomt hast. Evtl springt es dann um – bzw mal Details ein/ausschalten. Auf dem Garmin Oregon 600 gibt es bei den Karteneinstellungen “plastische Karte” mit der die Karte 3Diger dargestellt wird. Die openmtbmap kann da aber scheinbar nix mit anfangen. Gibt es eine Geländemodell Datei die man noch installieren kann um die 3D Darstellung in der openmtbmap zu aktivieren? Nicht direkt – nur indem du eine original Garmin Karte mit Höhenlinien installierst. Aber ehrlich gesagt – dass ist am Oregon 600 ziemlicher Schrott. Da der Kontrast damit flöten geht. Wenn schon bräuchtest du eine Original Topo – nur die hat ein DEM was halbwegs fein aufgelöst ist. Du kannst für Deutschland zum probieren mal nach der Garmin Winterkarte OSM oder so suchen – die ist direkt auf Garmin.de runterladbar -kostenlos – und hat ein DEM. Es reicht wenn die ans Oregon 600 gesendet wurde und deaktiviert ist – um das DEM für plastische Ansicht zu benutzen für alle Karten. ich habe die velomap auf meinem Etrex 30 installiert während im Basecamp die qlandkarte aktiv war. Macht das ausgewählte Basecamp-Layout einen unterschied für das Layout am Gerät? Ja – Bitte les dir das Beginner Tutorial und karten senden durch. Du kannst die Karte nicht am Gerät installieren – sondern nur mit Basecamp senden… (oder hast du mit qlandkarte GT gesendet? Dann ist Basecamp layout egal – sondern das aktuelle Layout in Qlandkarte GT ist entscheidend.